The Neugebauers: When "you're just standing there ... all fat." I can be so negative about my body. It's upsetting to think about how much time I waste thinking about what I look like. Being negative in my head is one thing, but being negative out loud in front of others is something else. 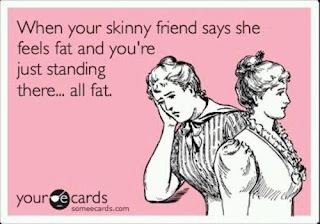 I've seen some comments from other women on Facebook who call themselves "fat." 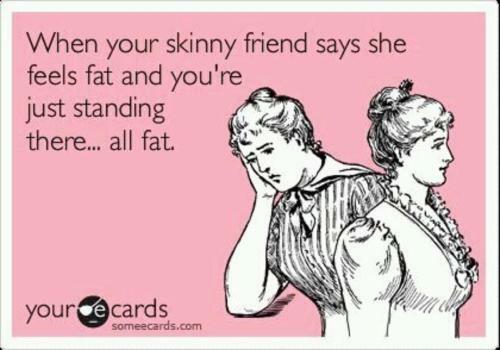 I don't know if these people even think of those who may be "fatter" than them and how it makes them feel. We blame the media for making us feel uncomfortable in our own skin because they send the message that thin is beautiful. It's easy to blame them because "the media" is such a broad term to remove any responsibility from ourselves. I'm going to make an effort to be kind to myself and love my body for what it is. It's a place where my spirit dwells :) It's time that I start learning to be happy about where I am now instead of thinking "I'd be happier if I were 20 pounds lighter." I wouldn't want Ella to ever think about herself in this way and that's why I'm also going to try not to put myself down in front of her OR anyone else. So far, I've been doing well with being consistently physically active, now I'm just trying to re-train my brain. I have lots of thoughts, but I deleted them to say: you are beautiful. You are a great wife and mother and Ella is a lucky girl. You work on training that brain because you are wonderful.